Buell had been a motorcycle enthusiast since he grew up on a farm in Pennsylvania. He raced motocross, then turned to road racing in the late ’70s before moving to Milwaukee to become an engineer with Harley-Davidson. 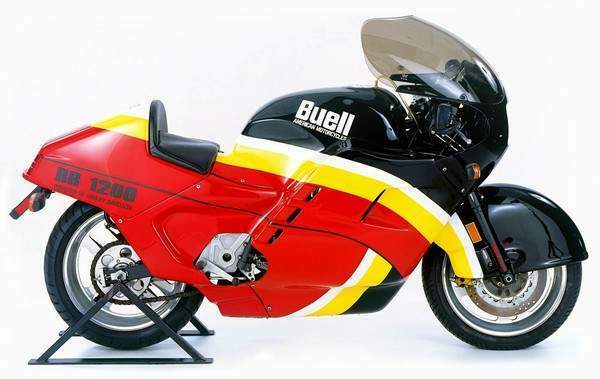 Continuing his racing career, Buell bought a British-built racebike for use in the AMA’s Formula One class of that era. This 750cc square-four two-stroke was explosively fast, but had serious reliability and handling problems. 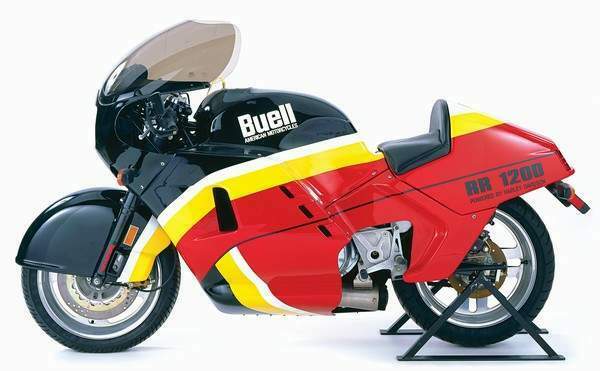 Buell sorted out those bugs, but then Formula One was phased out as Superbikes became the premier class of AMA road-racing. That left Buell with a well-developed chassis, suspension and brakes, but no motor to power his machine. So he turned to his employer, buying 50 of Harley’s limited-production XR1000 engines. Shortly after that, Buell switched to the mass-produced 1,200cc Evolution Sportster engine and built this machine, his vision of a sportbike for the ’90s. 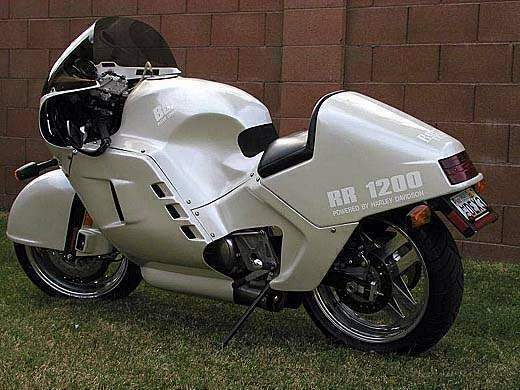 When it was introduced in 1988, the RR1200 caused quite a sensation, with its streamlined bodywork, rubber-mounted Harley engine, Buell-designed four-piston front brakes, and a Works Performance rear monoshock mounted under the engine. Over the next several years, Erik Buell refined those concepts into his own line of street motorcycles, while maintaining close relations with Harley. And in the ’90s, Harley began to invest in the motorcycle company its former engineer founded, eventually increasing its ownership to 98 percent of the Buell brand. With Harley financing and Erik’s vision, the Buell brand has moved on to create the Blast and the innovative Firebolt and Lightning of today.